Ryan Straight has been a golf professional since 1997. Was an assistant golf professional at Woodland CC and Meridian Hills CC. 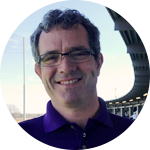 He has been the Head Golf Professional at Plum Creek GC, Prairie View GC as well as Harbor Shores GC. Most recently he was the Director of Instruction at Harbor Shores. Ryan has focused his attentions to helping develop young players, working extensively with The First Tee of Benton Harbor for the past 5 years. Ryan has had the privilege of working with players of all skill levels from very beginning players to players competing for a living.